Iron is a mineral that you need for proper oxygen intake. It also promotes energy uptake in the body. Most of the body’s iron is found in the hemoglobin in the blood--and hemoglobin is what transports oxygen to all the cells in the body. An iron deficiency will lead to reduced hemoglobin, and thus produce anemia--a condition where a person is chronically tired, weak, and unable to perform any physical exertion. There are certain segments of the population who are at risk to suffer from iron deficiencies: pregnant women (and women in general, who lose blood due to menstruation), children, and the elderly. But there are two types of iron supplements: plant-derived (or ferric iron) and animal-derived (or ferrous iron). And how the body absorbs them is very different. Heme iron: This is iron that binds to the hemoglobin in the person’s body. This type of iron is absorbed better in the human body. It is found primarily in lean red meat. Poultry and fish also contain heme iron, but less. It is also known as “ferrous iron”. Non-heme iron: This is iron from non-animal sources. It is not absorbed as well as heme iron. But non-heme iron that is taken along with some meat, fish, poultry or eggs, as well as Vitamin C, will be absorbed significantly better. 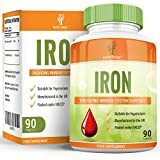 Non-heme iron is also known as “ferric iron”. Most dietary supplements will be from non-heme iron sources, but will have other nutrients to help the absorption. 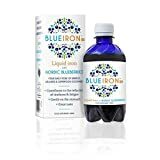 Other health benefits: Besides feeling more energetic, people who have taken iron supplements for anemia also notice an improvement in the appearance of their skin and fingernails. Adverse food effects: There are certain foods that disturb iron intake. Some of these are beneficial in other ways, so try to avoid taking them with iron supplements. For example, try to avoid tea, coffee, or milk products within an hour of taking iron supplements. They inhibit the absorption of the iron. Recommended daily allowance: The recommended amounts of iron has been determined to be 8 milligrams per day for men, and 18 milligrams per day for women. Since most Americans get enough iron from their diet, only the populations at risk for anemia (pregnant and menstruating women, infants, elderly) are advised to take iron supplements. “Gentle iron”: Taking iron in large amounts can lead to digestive problems. Taking too much iron (more than 20 mg/kg of weight) from supplements can lead to digestion problems, such as constipation, nausea, abdominal pain, and an upset stomach. 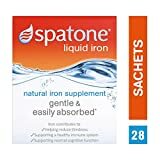 Some sell “gentle iron”, which is intended to be absorbed by the body without any adverse effects on the digestive system. For example, Zahler®’s Iron Complex is intended to be a easy-to-digest iron complex, containing all the nutrients for the formation of hemoglobin and healthy red blood cells. Beware of overdose: Dietary iron supplements contain warnings not to overdose on them. In fact, there is a certain toxicity in taking too much iron, especially in children under age 6. So be aware of the recommended daily amounts of iron that you can safely consume. 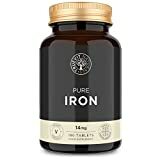 Iron supplements with Vitamin C: As we mentioned, even iron from vegetable sources is absorbed better when taken with Vitamin C. So you’ll see products like Thorne’s Ferrasorb which contains Vitamin C for better absorption of iron. 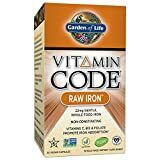 These compounds will contain Vitamins B6 and B12, because the iron uptake is better when all these nutrients are taken together, than when they are taken separately. Rainbow Light--is a vitamin supplement and health food company, that was founded in 1981 in Santa Cruz, California. They make natural food-based supplements, with a mind towards sustainability and being heedful of the environment. They make dietary supplements for women, men, prenatal care, children and teenagers. Nature’s Bounty--Nature's Bounty Company started with the Holland & Barrett stores in England in 1870. They presently make every vitamin, mineral, herb, and nutrition supplement product category. Their brands also include such names as Solgar, Sundown Naturals, Pure Protein, and more. Their products are directed at bone and joint health, beauty support, digestive health, heart health, general wellness, etc. Advanced Nutrition by Zahler--was founded by Dr. Zahler, who started a health food company that strives to develop natural treatments for common disorders, and to restore balance to the body. The company is located in Brooklyn, New York. They make supplements for all ages, as well as for every system in the body: bones and joints, reproductive system, digestive system, and the immune system. Thorne Research-- was founded in 1984 in Dover, Idaho. Their aim is to enhance people's health with nutritional supplements, health diagnostics and medical education. They make supplements for people as well as for veterinary purposes. Their products include compounds to support heart, liver, immune and digestive function, as well as sports performance enhancers.